Use on established lawn for quick green-up. 130 lbs. per acre (3 lbs per 1,000 sq ft). Can also be used on Truck Farm Vegetables, Corn, Potatoes, Onions, Gardens, Flowers, Shrubs, Hedges, and Trees . 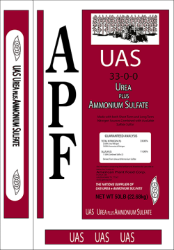 Product combines urea and ammonium sulfate. It is made with both short term and long term nitrogen sources combined with available sulfate sulfur. This nitrogen and sulfur only fertilizer can be used on areas where you have adequate levels of phosphorus and potassium. It was designed to be a safe alternative to ammonium nitrate. This high nitrogen analysis blend was intended for larger acreages for the high nitrogen using crops, such as, Truck Farm Vegetables, Corn, Potatoes, Onions, etc. However, it can be used on Lawns, Gardens, Flowers, Shrubs, Hedges, and Trees but, at a reduced rate compared to lower nitrogen blends which can give better coverage, i.e., more pellets per square yard. Truck Farm / Large Garden - non legume crops: In the spring apply and incorporate just before planting 7 lbs. per 1000 square feet. (This is equal to 300 lbs. per acre). Topdress and water in another 3-4 lbs. per 1000 square feet four to five weeks later on high nitrogen crops such as corn, potatoes, and onions. However, do not topdress your tomatoes, squash, watermelons, and especially beans. ESTABLISHED TURF: apply just prior to spring green up 3-4 lbs. per 1000 square feet. Topdress and water in 3 lbs. per 1000 square feet every 8-12 weeks as needed during the growing season. To avoid fertilizer burn, never apply the fertilizer to wet grass and always water in after the application. The middle spreader setting (50% open) on most spreaders is calibrated at 7-8 lbs. per 1000 square feet so with this blend you would open it up 25-33% of maximum. (Example: If the spreader goes to 16 max set the spreader on 4.) For hand held models that go to 5 set on 2-3. FLOWERS, SHRUBS AND HEDGES: Apply 0.4 pounds (1 cup) per 100 square feet (10 X 10 feet) and for flowers work well into soil before planting. Apply an additional 0.4 pounds per 100 square feet every 12 weeks, mixing lightly with topsoil, making sure not to disturb the roots. Water thoroughly after each fertilizer application. SHADE TREES and/or FRUIT AND NUT TREES: For an under the tree limb surface fertilizer application, apply 0.3 pounds per inch of the trunk’s diameter. Measure the trunk diameter five feet from the ground. Apply this fertilizer rate in early spring and again in late summer.